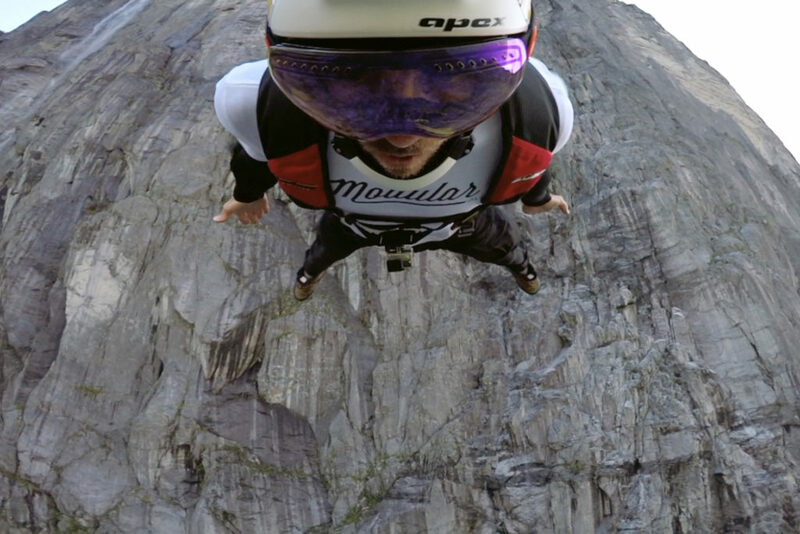 Few endeavors take more time, energy, commitment, money, and discipline than BASE jumping. That is, if you’re going to do it right. If you plan on skipping steps and taking shortcuts then you should be aware that few endeavors carry more risk. That said, BASE jumping is an incredible journey that will transform your life in ways I can’t begin to explain. It will take you to places you’ve never heard of, on adventures you’ve never dreamed of, and connect you with people you’ll never forget. But before we point you in the direction of the nearest BASE object you’ll want to make sure you do everything in your power to prepare adequately to become a safe, long-term, and ultimately old BASE jumper. I’m going to start with the assumption that you’re a licensed skydiver eagerly working your way towards the 150+ skydives which are required by most First BASE Jump Courses. If you’re not a licensed skydiver I’ll kindly ask you to stop reading here, find the nearest dropzone, and focus on learning to crawl before you try to run. Proper BASE preparation begins on the dropzone. 1. Deployment & canopy skills: This is where skydiving has the biggest impact on preparing you for BASE. Whether you plan to jump big walls or low buildings, canopy skills are critical to ensuring you remain alive and uninjured. a. Clean, consistent, efficient PC tosses: If this isn’t instinctive to you, you’re definitely not ready for most BASE jumps where a timely and efficient PC toss is mandatory to avoid catastrophe. Make sure your PC tosses are precise, efficient, strong, into clean airflow, and stable every single time. b. Canopy inflation: Compared to BASE canopies skydive canopies open in slow motion. 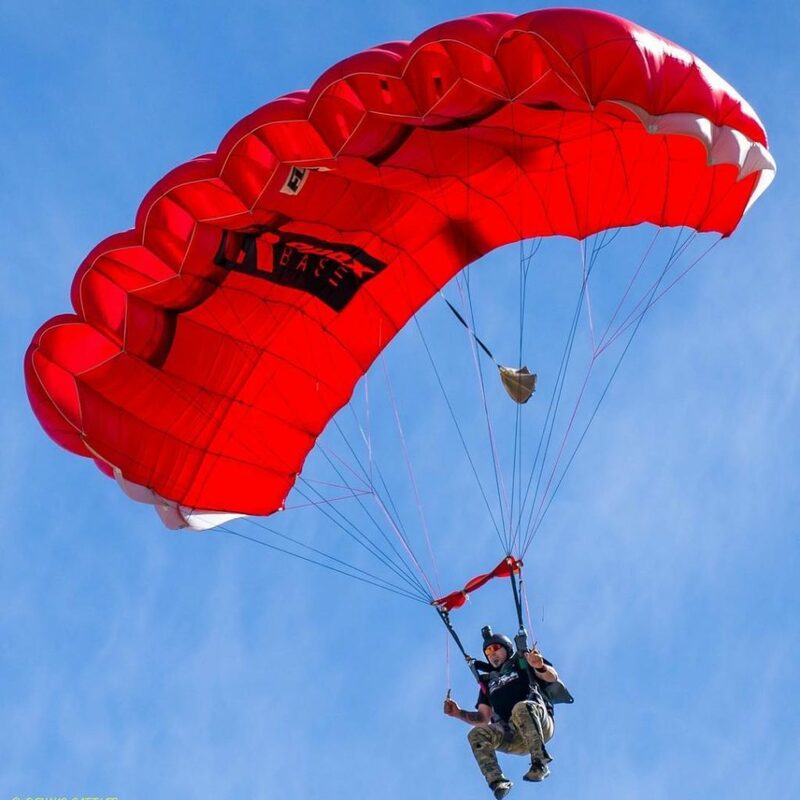 You should be in tune with your canopy throughout the entire deployment; immediately aware of your heading and any potential malfunctions, and prepared to make immediate inputs before your canopy reaches spanwise inflation. c. Fly your canopy like you’ve never flown it before: Use your risers and toggles to stall your canopy. Fly it backwards. It will fly (read: “stall”) backwards. Practice heading corrections on two risers, on a single riser, and on toggles. Get comfortable stalling your canopy and whipping it around 180 degrees as quickly as possible. Disclaimer: These drills are best performed on BASE canopies, or skydiving canopies that are not purpose-built swoop machines. You’re welcome to try and fly your Petra backwards, but we take zero responsibility for the outcome! d. Heading correction: Before you deploy make note of your heading. As your canopy extracts and inflates make sure you end up flying with that same heading. Correct any off-heading openings as quickly and smoothly as you can. It’s just practice now, but some day these drills can save you from an object strike. This is also a critical skill for multi-way BASE jumps. You don’t want a buddy strike either. f. Accuracy: Put a cone (or any soft, harmless target) in the landing area. Land next to it every time. Don’t just practice until you’re able to land next to it…practice until you never miss it. Every jump should be an accuracy jump. 2. Night Jumps: Get comfortable in the dark. Some objects are more…accessible…after the sun has set. 3. Tracking: If big walls are in your future, then so is tracking. Start learning to track slick, and eventually move up to a two-piece tracking suit. Stay away from one-piece suits early in your BASE career. Don’t focus on maxing out your freefall times, that’s a useless exercise in BASE training. Focus on maximum horizontal speed. (A FlySight can be a valuable tool here.) Make sure your deployments are smooth and stable. If you get really comfortable in the suit start playing with angles and aerials (for instability recovery). Learn to track efficiently. Slick at first, and then you can advance to a proper BASE-style two piece tracking suit. 4. Dead air exits: Balloons and helicopters. Don’t waste these opportunities to hang from the strut or see how many front flips you can huck. Practice stable dead air exits every chance you get. 5. Rigging Skills: Packing a skydiving canopy is a start, but it’s far from satisfactory if you want to get into BASE. Basic rigging and gear knowledge is critical in an environment where there’s no DZO, no S&TA, and no riggers looking over your shoulder to make sure you aren’t packing yourself a malfunction. a. Learn to pack reserves: This one isn’t mandatory, but it definitely helps. BASE pack jobs look a lot like a reserve pack job. If you aren’t willing to get your rigger’s ticket then plan to hang out with your rigger the next time he/she packs your reserve. Watch, ask questions, learn something, annoy them, and tip them nicely for their time and guidance. b. Basic rigging: Changing closing loops, hooking up 3 rings, continuity checks on your lines, connecting canopies to risers on both hard and soft links, changing toggles…learn this stuff! You’ll use it all, and more, in your BASE career. c. Be comfortable and familiar with your gear: Examine it. Understand it. Don’t just ask HOW it works, learn WHY it works. 6. Ground crew: Depending on your local scene, BASE can have a bit of an underground cult feel to it. You may need to earn your way into the local crew in order to get access to information and objects. Meet your local jumpers. Ground crew for them when they jump. Get good video and photos that make them look cool. Watch them pack and ask questions. It’s not always easy to find a dedicated mentor, but you can always find a crew to hang out with and learn from. 7. Educate yourself: If it’s cloudy out and you’re not skydiving, take some time to explore the academic side of BASE jumping. Forums, manufacturer’s websites, blogs, and even (cover your ears older jumpers) YouTube videos can be a source of BASE information. Many reputable manufacturers and FBJC providers offer up free educational videos and articles on their websites. 8. Read the BFL: On that note…read the BASE Fatality List. Read it again. Much of today’s BASE knowledge comes from this list. Understand what has killed people in the past and how these accidents may have been prevented. 9. Air sports: Paragliding, speed flying, etc. The more canopy experience you have, the better. Mountain based sports also have the benefit of requiring some degree of weather knowledge, which is critical in BASE. 10. Climbing: We climb a lot in BASE. We climb up to sketchy exit points, and out of sketchy landing areas. Get comfortable with climbing techniques and build your endurance now. It’s a real bummer to get to an exit feeling completely wiped out from the climb up…or never getting there at all because the climb was too technical or demanding. 11. “Aerial awareness”: Any sport that helps build your awareness while in freefall, or at least disconnected from the ground, can be valuable. Gymnastics, high diving, trampolining, etc. None of these activities will directly make you a better jumper, but they all help you get comfortable in the air, especially while performing aerial maneuvers. Freeflying is an excellent way to develop your “air awareness.” These guys are pros, do not attempt to learn how to freefly in the BASE environment please. 12. Honorable Mentions: Any activity that helps build fast reflexes and improve reaction time will indirectly benefit you in BASE, and in life. Speed stacking red party cups? Sure. Juggling chainsaws? Why not? Freeway tap dancing? Go for it! It might help, and certainly won’t make you a worse BASE jumper. This list is not all-inclusive. 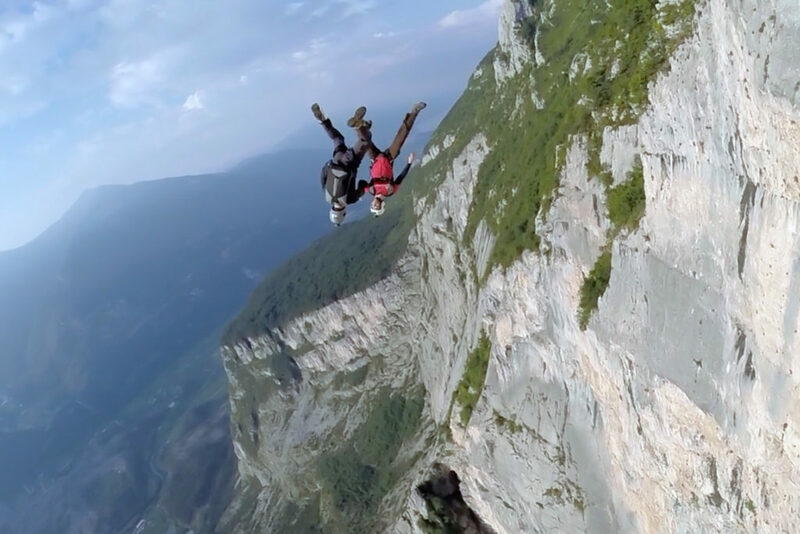 There are a lot of other things that you can do to prepare for your first steps into BASE jumping. Do it all, as much as you can. Be the best prepared BASE student you can possibly be. Not only will it make you safer, but experienced jumpers will recognize and appreciate the effort you’ve put in. The result? Well…they’ll probably take you on more incredible adventures!